The Pick, Miami final: Djokovic has owned Murray in nearly two years, but is Andy ready to beat him? Instead, if he upends Novak on Sunday at Miami, people in Scotland will come up to him, shake him with two hands, say he is sounding great with a large smile, go grab a thick beer, and raise a glass or two. They will merely say ‘Cheers Andy!’ while they wink-wink, with everyone thinking that Murray has returned by winning a major tournaments again. At this point, if Murray wins, it will be huge for Andy, because he hasn’t beaten Djokovic since 2013 Wimbledon and that has been a long time. The Serbian has beaten him six times in a row, wasting him at Indian Wells in the semifinals. During the first three sets against Djokovic in the final of Australian Open, Murray had it right there, but then in the fourth set, the world No. 1 turned on the gas while the world No. 4 looked like he was asleep and was blasted 7-6(5) 6-7(4) 6-3 6-0. Murray simply didn’t believe in himself. Fortunately, Murray has played Miami extremely well, so much so because he owns a house there and works out during November and December. He practices in Key Biscayne regularly and he knows how hot the weather is, whether it’s stick and muggy or have it just right. He has put together some tremendous tournaments, but here is the problem: Djokovic has been better overall. In 2007, when the now 27-year-old Murray was an up-and-comer at Miami, he reached the semifinal, but he faced the now 27-year-old Djokovic in the semis and the new Aussie Open champ smoked Andy 6-1 6-0. However, in 2009, Murray played as well as he ever did, playing Djokovic and out thought him 6-2 7-5 to win the final. But in 2012, the two faced off in the final again and this time Novak out punched Murray 6-1 7-6. 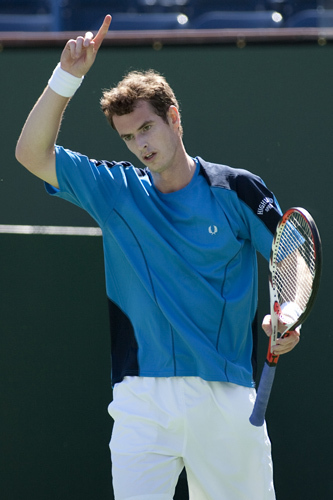 In 2013, Murray won the Miami title, blasting David Ferrer in the final. But last year when he and Djokovic went at it, the Serbian won 7-5 6-3 over Andy. Clearly, Murray loves the area, but Djokovic has been better on hard courts, at Miami and elsewhere, owning a 17-8 edge over Murray overall. Murray and Djokovic have known each other since they were young teenagers so they know each other’s ups and downs. There are no tricks to be had. Yes, they can change tactics here and there, but it’s all about who plays better and who does not. Djokovic owns eight Grand Slams, while Murray owns two. That is enough to say that the Serbian has be better than Andy, but Murray can eventually catch him, if, and I mean if, he stops being conservative and let it all hang out. After he fell to Murray in the semifinals, Tomas Berdych said that Andy played more aggressively that he usually does so think if exactly what Andy has to against Djokovic. He knows that he can go stroke-to-stroke with his backhand, but he has to go often and early, not waiting to see if Novak will try and crush a winner immediately. The same goes here with his forehand: Murray cannot hit his forehand against Djokovic, but he can move inside the box early and try to get him way out wide. Obviously, he must move his first serves around and, with his second servers, he cannot push the ball in, which has been his weakness for years. Perhaps most importantly, Murray has to come into the net more often, because he has beautiful hands and it’s to his advantage to shorten points. Djokovic has been extremely solid since the start of the year. He is so confident that even when he isn’t playing great he’d figure it out and race away. Murray looked pretty good this year overall and he certainly has looked better than last year, when he was coming back due to a serious back injury. Eventually, Murray will get there and beat Djokovic somewhere, someday, but until he actually stuns Novak, I can’t see Andy full of bravo. Djokovic will win in three sets. The Pick, Miami: Serena Williams vs. Simona Halep. Is the Romanian ready to upset the near perfect American? This is a gigantic match because Halep wants to show the world that she is good enough for anyone, which includes the world No. 1, Serena Williams. The Romanian has said that she wants to win a Slam and become No.1 but in order to do so, she has to knock off the queen, assuming that Serena stays healthy. At the age of 33 years old, Williams can’t be at No. 1 forever, but right now, she is the best player by a long shot and there is no one, and I mean no one, has proven that they have beaten Serena if she is playing 100 percent. With that said, Halep has been more consistent over the past two years and on the hard courts, she seems exactly what to do. Of course she hasn’t won every tournament and yes Maria Sharapova has troubled her, but she hasn’t taken one loss, become extremely emotional and disappear. Now she is calm and after a loss, wake up the next day, lift her chin up and moved on. That’s why she has won 14-matches in a row at Doha, at Indian Wells and now in Miami. Unfortunately, Williams pulled out of Indian Wells prior to their semifinal and Halep was unable to take her gloves off and seize the day. Two weeks later, the 24 year old will have another chance with even more confidence. Interestingly, the last time they played was in the 2014 WTA Finals in Singapore. Halep was on fire and super consistent and Serena had not woken up yet. Simona crushed her 6-0 6-2 in the Round Robin. 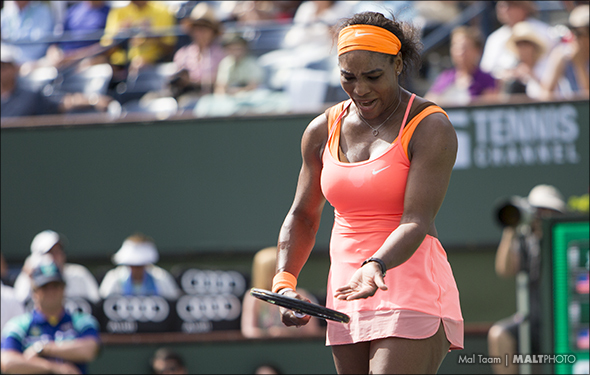 Serena was very upset, saying that her serve was so bad that she was worse than the 10-and-unders. Then she locked in and by the time for the final against Halep, she was ready to nail the lines everywhere and got her right back, smoking Simona 6-3 6-0. Mentally, Halep wasn’t there, as she knew that Serena was going to play very well and she was nervous at the first ball. That was in late October and now it is April 2. Serena hasn’t lost a match since then and outside of the Australian Open quarterfinal against Makarova and at Fed Cup when she went down to Muguruza, Halep has been very smart. She hasn’t played great every match but she has imposed herself, winning seven matches in three sets, which means that she isnt panicking. The 19-Grand-Slam Serena rarely panics, so if Halep can win the match she has to fight all the way from the finish line. Williams is a much better serve, as she can boom the ball, ace after ace. Halep’s first serve has improved and can kiss the lines, but if she has to hit her second serves frequently, she has to take her chance because if she just pops it into the middle Serena will crush her returns where Halep cannot even touch them. Halep can run all day and she is super fast, so if she can start the points 50-50 she will be right there, but she cannot push the ball and merely hope. She has to attack almost immediately and go for her favorite combo – her backhand crosscourt sharp and her foe is stretched to her left and then hammer her backhand down the other side and on the line – and any time Serena is out of position she has to move forward. Serena is more powerful and can certainly out slug her with her forehand, which is heavier and deeper. If Williams is feeling well, then she will charge the net and end the points quickly. Really, if Serena plays great she will win the match, even if Halep plays a terrific contest. Serena is still just better than she is. However, even though Serena has dominated Miami over the years, she is due to lose this year – right? Serena won’t play fantastic, Halep will and grab it in three tremendous sets. 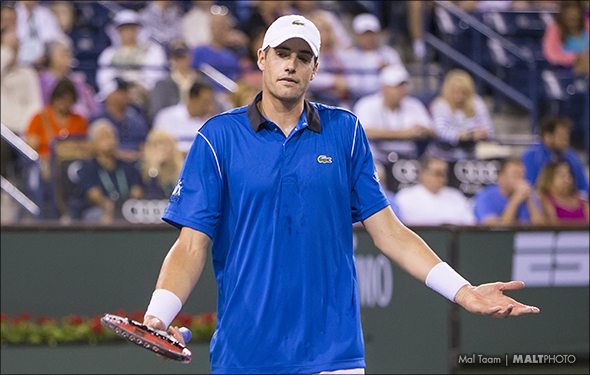 Maybe John Isner has come to life again. On Tuesday, he was almost gone against Milos Raonic in the second set in the tiebreak and even though he was mad, he maintained composed and grabbed it. In the final tiebreak in the third set, he didn’t shake his head or be depressed and kept on chugging, playing more forceful on the baseline. Running and racing on the ground, Kei Nishikori is much faster than Isner is, so the American has to keep the points quickly. Nishikori isn’t as good as the Big 4 when it comes to the returns, he has improved a large amount in the last year and a half, so Isner has to fool him with his first and second serves. Clearly, Isner has one of the biggest serves out there and it is very hard to break him, but the Japan can poke the balls back and get ready to rally. He will yank the balls side to side that the 6-foot-10 will be gasping for air. Nishikori can smoke his forehand and backhand, he has developed a larger first serve that he can move it around, and he can also rush to the net and put away some hard passing shots. Isner can blast his forehand and here and there, he can hit the lines off his backhand. He only does it occasionally, but on some nights he takes a risk. Yes, Isner can put away his volleys but he has to be on the net because if he has to bend low he is usually in trouble. Since last year and most of this year, Nishikori was much more courageous and believes that he could topple the Big 4, as well as the rest of the top 10. He has not yet to win a Slam, but he came close to reach the 2014 US Open final, even though he was tired and looked a little scared in front of the bright lights. But on Miami, he spent years of training and he knows exactly how to play. Isner will serve and make the match close, but in the end, Kei will break early in the third set and hold on.